The 2018 1/4oz Lunar II Year of the Dog gold coin is one of the latest additions to a series that's popular with collectors around the globe. These fractional coins are an affordable alternative to larger denominations and they're a smart way for investors to add .9999 fine gold to their portfolios in easy to manage, yet still substantial, amounts. The Lunar II Series from Australia's Perth Mint is inspired by the animal characters associated with the Chinese Zodiac Calendar. 2018 is the Year of the Dog and to mark the occasion, talented artist Ing Ing Jong has created a beautiful new reverse design featuring a retriever, a breed that's known for its loyalty. The coin is the 11th in a collection that made its debut in 2008 (Year of the Rat) and which will end in 2019 (Year of the Pig). Choose 1/4oz 2018 Lunar II Series Gold coins as a special gift for those during any Year of the Dog. Previous Dog years according to the ancient Chinese Calendar are 1946, 1958, 1970, 1982, 1994 and 2006. Famous people born in the Year of the Dog include Madonna, Justin Bieber, Sophia Loren, David Bowie, Alan Arkin, Cher and Elvis Presley as well as two of America's most illustrious Presidents, Benjamin Franklin and Donald Trump. This beautiful coin is a smart addition to any collection as well as a good choice for investors. 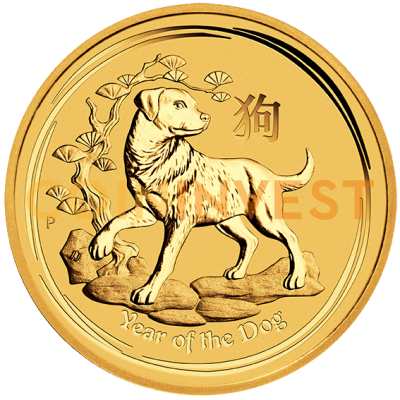 CoinInvest is pleased to add the 2018 1/4oz Lunar II Year of the Dog gold coin to its extensive catalogue of gold and silver bullion coins. Add other Lunar II gold coins from the Perth Mint to your basket or explore exciting alternatives like the UK Lunar Shēngxiào Collection.